Halloween is a great time for kids, teens and adults to get together and have a blast! But don’t forget about your furry little friends this Halloween! We found some cool ways to make it a fun and safe time for them as well! 1. Dress your pet up! Whether you have a cat, dog, hamster or guinea pig, there’s bound to be a cute little costume for your furry friend! If you can’t find one at a pet store, make one! Check out the best dog costumes from the Tompkins Square Halloween Dog Parade! 2. Take them Trick or Treating with you! It’s probably wise to leave your cat or small animals at home to keep them safe. But if you have a dog, use this as an extra walk! Dress them up and let them have some fun! 3. Get them some Special Treats! We all know kids gorge on candy for weeks after halloween. Don’t leave your pet out! Get them some fun treats from your local pet store so they feel like they hit the jack pot too! 4. Have a Pet Halloween Party! Lots of people have pets, so why not have a party where people can dress their pet up and bring them along! It will give your pet some companionship for the night that is sure to be a treat! 5. Most Importantly: Keep Your Pet Safe! Halloween can be a chaotic and scary time for pets as well. With so many people coming and going from your house, it’s enough to give your protective dog or scaredy cat a heart attack! Make sure you adjust to the demeanor of your pet. – If your pet doesn’t like people much, keep them entertained in another part of the house and don’t take them trick-or-treating. Turn your doorbell off and keep your front lights off if you don’t want trick or treaters or you yourself aren’t home. This will lessen the amount of noise your pet hears. 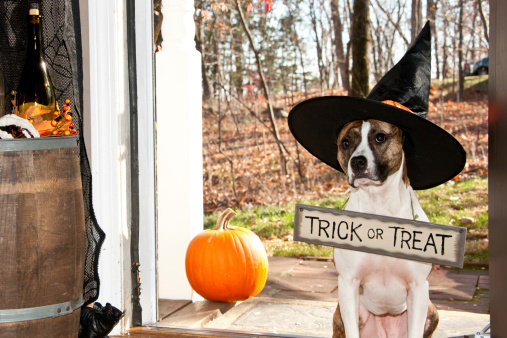 -If you choose to take your pet trick-or-treating with you, make sure to keep them securely by you at all times. Don’t let kids take them by themselves. 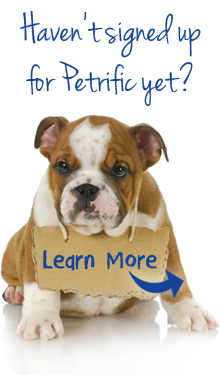 Stand away from the doorstep with your pet and let your kids go ring the doorbell. You never know if that house has a pet that won’t be friendly to yours. If your pet starts to get agitated because of all the people, give them a break or take them home. You don’t want anyone getting hurt or your pet having a melt down. -Don’t force your pet to dress up if they are resisting it. You want them to have fun, so let them be themselves if they aren’t the dressing up type. -Finally, keep your pets away from the candy! You don’t want them getting sick! Have a Safe and Happy Halloween with your pets!